I've got a good news for Malaysia's Internet Marketer. Now we are able to transfer our hard earned money straight to our local bank in Malaysia. Before I proceed any further, someone might asked, "what's the heck is PayPal?" In short, PayPal is an online secure payment center, the world's most popular 'middleman' for online purchasing. Let say you purchase a product from a certain website whereby you may be given an option to pay either using their so-called secure web page or you can use Paypal (if you have an account there). Once there, Paypal will only give the merchant your name, address, and the amount of payment without releasing other information. Today over 99 million Internet users prefer using PayPal to send money to each other via email. It has become such a convenient and trusted way to transfer money online. In fact, 95% of eBay's purchases goes through PayPal. Okay, back to the good news. But then, many others did not find it convenient especially for those who have multiple PayPal's account! They are still not sure how much the local banks gonna charge them for this service? I'm still not sure whether PayPal gonna charge for using this service? It's unfortunate if we have to pay twice - once in US and the other one here in our local bank! 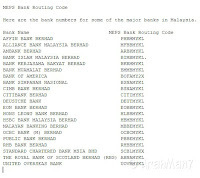 Anyway, here's how to link PayPal to Malaysia Bank's account (complete with graphics)? Well, that's it for now. See ya' when I see ya'. Take care. p/s Join Malaysia's new advertising company. Head over to CatchEye now to know more. See you on the other side.